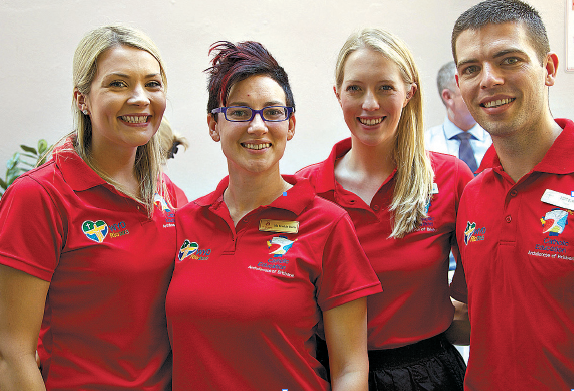 Alana McDonald, from Our Lady of the Angels School, Wavell Heights; Frankie Burns, fdrom St Michael's College, Merrimac; Claire Babbage, from St John Vianney School, Manly; and Scott Burns, from Mary MacKillop School, Birkdale, at the launch of the new religious education curriculum for Brisbane Catholic Education. CATHOLIC students will be encouraged to “enter into a profound personal encounter with Christ” through the new religious education curriculum, Archbishop Mark Coleridge said. Archbishop Coleridge gave his blessing to the new curriculum at the launch on Friday, October 11 at Brisbane’s Mercure Hotel. The revised curriculum for Pre-school to Year 12 has been called “the most comprehensive update” since the last revision in 1997. More than 600 representatives of Catholic education across Queensland welcomed the new Religious Education Curriculum. The content of the curriculum includes a body of knowledge on sacred texts, beliefs, church, and Christian life. Religious education teachers are also encouraged to use the online resource called Learning Bytes to assist in teaching the new curriculum. There is also a smart phone app on Catholic theology that would be required for teaching the new curriculum. Teachers have been advised to include all four areas when planning and teaching religion in the classroom.Religious Education principal education officer Mark Elliot and senior education officer Leigh Stower, co-ordinated the new curriculum. Members of BCE’s Religious Education Services team and ResourceLink contributed to the writing of the curriculum and its associated resources. The project was supported by Fr Anthony Mellor as theological advisor, Fr David Pascoe as archdiocesan censor and Dr Peta Goldburg, from Australian Catholic University. Archbishop Coleridge said it was the beginning of a new era in the way Catholic schools taught religious education. “Often we find ourselves with structures and strategies, which are a response to the facts on the ground, twenty or fifty years ago,” he said. “They may have worked brilliantly then but perhaps not now when the facts on the ground are different. “Planning for the present time and future of the Church in all its ministries must be not only a response to the facts on the ground, but also a response to the grace of the moment. It is very good, therefore, that the Brisbane Catholic Education office has read the signs of the times and taken the complex decision to review and re-create the religious education curriculum for all schools and colleges within our archdiocese. Brisbane Catholic Education executive director Pam Betts said the new curriculum complemented BCE’s vision for religious education. “The schools and colleges of the Archdiocese of Brisbane aspire to educate and form students who are challenged to live the Gospel of Jesus Christ and who are literate in the Catholic and broader Christian tradition so that they might participate critically and authentically in faith contexts and wider society,” Ms Betts said. “This curriculum has been promulgated by the Archbishop for use in all Catholic and ecumenical schools in the Archdiocese of Brisbane,” she said.